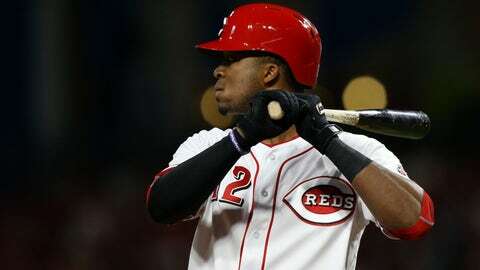 Utility player Rosell Herrera, claimed off waivers by the Royals on Saturday, was hitting .154 in 11 games for the Reds this season. As they continue to reshape their roster following an offseason in which they lost several key players, the Kansas City Royals have been scouring the waiver wire in search of talented young performers. They took advantage of the waiver system again on Saturday, claiming minor league utility player Rosell Herrera off waivers from the Cincinnati Reds. Herrera, who had been designated for assignment by the Reds, was immediately optioned to Triple-A Omaha. To make room for him on the 40-man roster, right-hander Nate Karns was transferred to the 60-day disabled list. The 25-year-old Herrera made his big-league debut on April 26 and has played in 11 major league games for Cincinnati this season, hitting .154. The switch-hitter is batting .267 with eight doubles, two triples, three homers and 11 RBIs in 23 games with Louisville, the Reds’ Triple-A affiliate, this season. He has seen action at every position besides first base, catcher and pitcher between the majors and Triple-A this year. He was a 2014 SiriusXM All-Star Futures Game participant, while he was named the South Atlantic League’s Most Valuable Player in 2013. Karns has been on the DL since the beginning of the season due to right elbow inflammation, so his move to the 60-day list simply clears a 40-man roster spot and will not require him to miss any extra time.